The brightest Daylight lamp is now available! If you need maximum light, look no further. With 250w of pure white light, this is a professional high-power workstation lamp, lighting up wide areas on your desk, work station, drawing board or large painting. 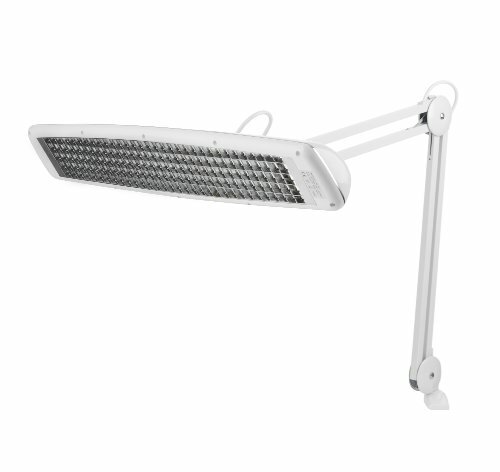 The lamp has 3 x 14w energy saving Daylight tubes offering an incredible 42w pool of light. The 24” x 4.3” large shade can be smoothly adjusted vertically, horizontally and laterally to any desired position. With this great light you will be amazed how much better you will see the finer details and inspiring colors in your work. It is also widely used by printers to check printwork and books and by jewellers to inspect precious stones and gems. The low heat full spectrum Daylight light with 6,500°K improves contrast, reduces glare and is the best lighting available for color rendering. This is maybe the best working light you will ever use! If you have any questions about this product by Daylight Company LLC, contact us by completing and submitting the form below. If you are looking for a specif part number, please include it with your message.